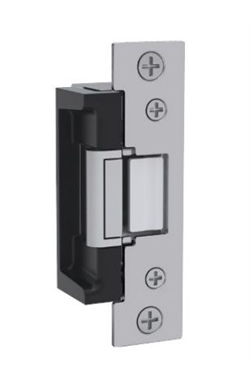 The HES 7000-12 is a 12 VDC dual pre-load solution for cylindrical latch bolts and rim exit devices. The unit offers two solutions to address pre-loaded doors. The in-frame adjustable feature allows the installer to easily adjust the electric strike opening to accommodate the horizontal position of the latchbolt after installation. The pre-load release function allows the electric strike to operate smoothly throughout the year under varying loads on the door caused by air conditioning pressure, changes in the weather, warped doors or doors with weather stripping that often bind standard electric strikes. This unit accommodates cylindrical latchbolts up to 5/8" throw and rim exit latchbolts up to 3/4" throw.